Children LOVE our Princesses! We make sure to ship all the appropriate accessories with our Princess Dress Rental- like wigs, headbands, necklaces, gloves, and hoops. We ship via UPS ground and include the return shipping label, so the first business day after your event, you simply repack and give to UPS driver or drop at UPS store (no need to wait in line). 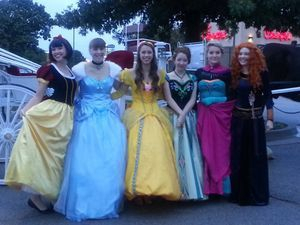 Costume Party is a family run business in Starkville, Mississippi. Our customers have so much fun they sent these photos for inspiration for future fabulous Princess Events! 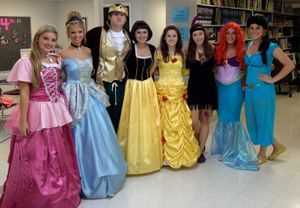 If you are local, we may be able to help you find a Princess to come to your party, just ask! If you would like to peruse our Princess Dress Rental Costumes, simply click on the photo to the left and it will take you to our Online Store - look for the Princess Dress Rental Heading.